Has Justice League Dark Already Found Its Constantine? 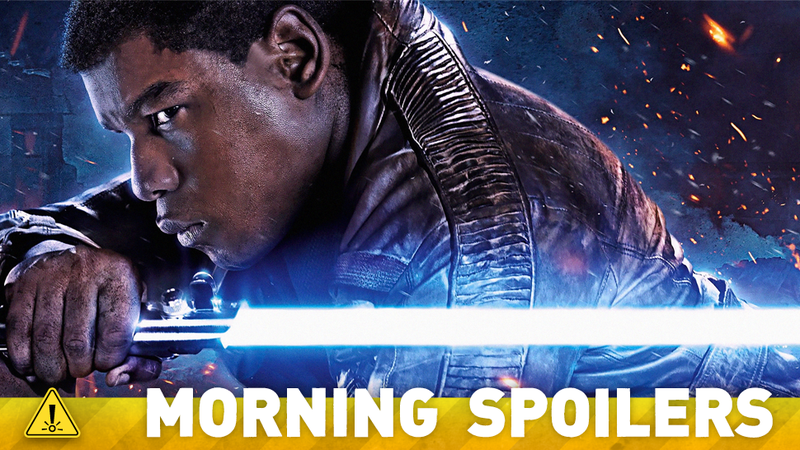 John Boyega talks wielding a lightsaber in The Force Awakens. Quicksilver has another elaborate super-speed sequence in X-Men: Apocalypse. Milla Jovovich looks different in Resident Evil set pictures. Plus, Sarah Dollard on her Doctor Who episode’s big connection to the season’s arc, and a new Jessica Jones clip. So Many Spoilers! Salt shakers at the ready, but Latino Review claims the casting for the long-planned movie about a team of supernatural-themed DC heroes is under way, with discussions building from Guillermo Del Toro’s suggestions from before he departed the project. Warner Bros. execs reportedly agree with Del Toro about Swamp Thing being played by Ron Perlman, and want to approach the actor. On top of that, two actors are being considered for John Constantine: Colin Farrell and Ewan McGregor. Whichever actor is not picked for Constantine could instead be offered Jason Blood, the human side of the demon character Etrigan. For now though, treat this as a rumor and nothing more. I held it in my hand and I just felt, you know, the clouds open up and the white doves come flying down. It feels very, very good. I hugged it for the whole day. I didn’t allow anyone to hold it but me. You go to make a movie and all you do is get criticized, and people try to make decisions about what you’re going to do before you do it. Y’know, it’s not much fun, and you can’t experiment; you can’t do anything. You have to do it a certain way. I don’t like that, I never did. I started out in experimental films, and I want to go back to experimental films, but of course no one wants to see experimental films. We are just starting. We have just started researching and spit balling. Nicole (Perlman) and I have decided that we are going to have a good time. BBC Entertainment correspondent Lizo Mzimba appears to have revealed the name of Riz Ahmed’s character: Bhodi Rook. Yeah, Quicksilver does his thing again. It’s bigger, longer, and more detailed. I think it’s an amazing sequence that they’ve put together. It’s so cool to take that much time to make something like that really pop and really work. Knock on wood, I think it’s going to be a fun and enjoyable sequence for people to watch, with Quicksilver running around and doing his thing in slow-mo time. I hope people like it. Milla Jovovich shared another picture from behind the scenes on Instagram—this time of her in makeup and prosthetics as an older version of Alice. “Fear the Raven” writer Sarah Dollard discusses the episode’s importance the the overall arc of season 9. Kurt Sutter has taken to Instagram—well, a full page advert in The Hollywood Reporter, via Instagram—to confirm that the series has been axed due to poor ratings and reception. “Human For a Day” – Kara and her friends must rely on their inner strength and courage when an earthquake strikes National City. Also, Alex’s mistrust of Hank reaches a breaking point when the earthquake traps them in the DEO with Jemm (Charles Halford), a powerful alien escapee, on SUPERGIRL. THE WHOLE IS DEADLIER THAN THE SUM OF ITS PARTS - CARLSON YOUNG, JACQUELINE TOBONI AND DAMIEN PUCKLER GUEST STAR - Nick (David Giuntoli) and Hank (Russell Hornsby) are called to the scene when three Wesen go out on a hunt at a local dump and get more than they bargained for when two turn up dead after they encounter the mythical Rat King. Meanwhile, a very badly wounded Trubel (guest star Jacqueline Toboni) is taken to the hospital and Nick finally meets Meisner (guest star Damien Puckler). Finally, Jessica flips when Trish tries to call out Killgrave in a new clip from the show.